Medford high school students face academic challenges on the path to graduation and post-secondary success, including meeting the desires and goals that family and loved ones have set for them. The students attending the Hispanic Academic Outreach (HAO) program face these and additional obstacles presented to them as children from migrant families. 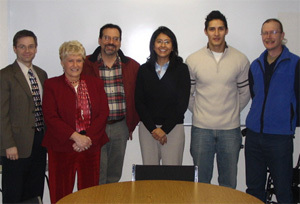 HAO is a project of the Southern Oregon Education Service District's Migrant Education/ELL department. The HAO program provides migrant students with academic assistance, mentors, access to social services, and information concerning higher education. The program team consists of Charlie Bauer, Director; Andreas Horaites, Site Coordinator; Jeff Painter, Volunteer Coordinator; and Fili Bencomo and Marlene Yesquen, Mentors. Fili Bencomo and Marlene Yesquen, the HAO mentors, wrote this article. We believe that it is important to introduce ourselves at this time in order to give you a better understanding of the work that we do. Fili is a current senior at Southern Oregon University pursuing a degree in Health and Physical Education. He also graduated from South Medford High School and was a child from a migrant family. Marlene is an attorney with the Center for Non-Profit Legal Services in Medford. She was born and raised in Virginia and is also a child from first generation immigrants. Our backgrounds and experiences enable us to better assist the HAO participants. We know where the students are coming from as we have dealt with the pressures of high school, the unfamiliar systems established in the United States, the poverty, and the anger of being misunderstood. Now, just two months into the program, we have worked with over 30 migrant students from North and South Medford High Schools' ninth and tenth grade classes. We have been able to provide homework help in an array of subjects. We have met with parents and discussed concerns that may affect their child’s education. We are assessing each student’s needs and meeting one-on-one with them to help them overcome any challenges that they face. Finally, as English is a struggle for many of our participants, we provide English Language Development (ELD) classes. HAO focuses on the future and even though we are working with ninth and tenth graders, our goal is to keep them in HAO until they graduate from high school. This is a voluntary program and all of our students have to want to come on their own two times a week. Most of our students have not been on a college campus or outside of Medford. HAO plans on providing college preparedness by taking the students to visit some local college campuses. We are planning to take the students on trips outside of the Medford area in order to familiarize them with their surroundings and to support them around school and family challenges. Even though the HAO program is fairly new, we sit in amazement every day as we see the positive response that we are getting from our students when we devote our individual attention to their needs. The HAO program is not about the students achieving HAO's goal for them; it is focused on assisting the students to achieve the goals that they set for themselves.